If you have never tried couscous, you are truly missing out. Couscous is a coarsely ground semolina pasta. It is a staple in many North African countries, parts of Europe, and the Middle East. It has popped up on American menus and dinner tables as of late, and is a nice replacement for your regular old potatoes or pasta. Traditional couscous requires considerable time to prepare. But, the parboiled couscous is now available in most grocery stores and only takes minutes to make; usually just adding water or broth, olive oil, a little salt bring to a boil, then add the couscous, then remove from heat and cover for 5 minutes. It’s as simple as that. Couscous is traditionally served under meat and vegetable stew or as a part of a salad. But, really you can use it any way you prefer. 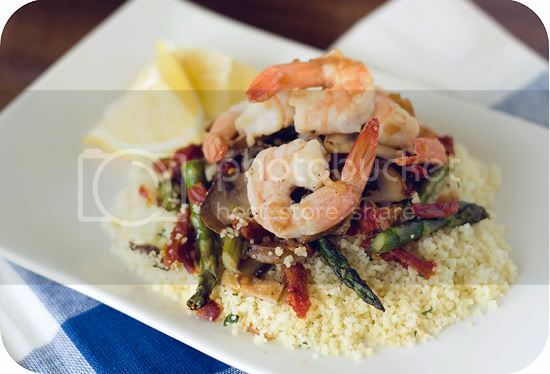 Here is a great recipe I made with couscous. It would also be great over a bed of linguine pasta, but hey, why not try something new. in a medium saucepan, boil broth, salt, and parsley. when it comes to a boil remove from heat and add uncooked couscous and stir. cover for 5 minutes, then fluff with a fork. meanwhile, in a large skillet heat 1 tbs of the olive oil, and 1 tbs butter over medium high heat. add 3 of the minced garlic cloves and all of the minced shallots. fry for 1 minute, then add the shrimp. sprinkle shrimp with salt and pepper to taste. cook shrimp for 2 1/2 minutes on each side. squeeze fresh lemon juice over the shrimp, then stir, and remove from heat and place shrimp and sauce onto a plate to rest. wipe out the skillet with a paper towel, then return back to heat with the remaining 1 tbs olive oil. add asparagus, mushrooms, and saute, stirring for 5-7 minutes or until soft. add sun-dried tomatoes, garlic, and salt and pepper to taste, cook for 2 more minutes. return the shrimp along with any sauce to the pan and mix well, stir for 1 minute. then, remove from heat and serve immediately over couscous, and sprinkle with a little parmigiano reggiano. That looks amazing! Can't wait to try it. I love the mix of every ingredient that you used. Yuuuuum! Looks so yummy! I am so looking forward to cooking with fresh Spring produce. Pasta primavera is my fave.